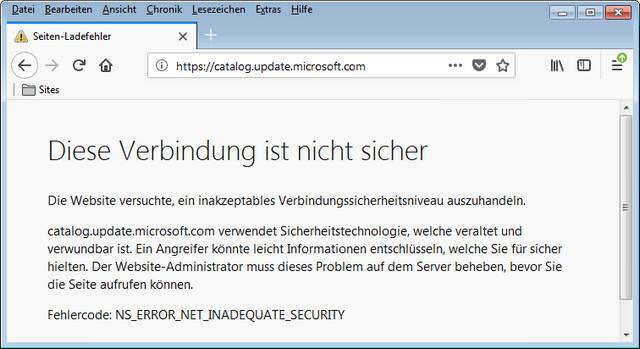 [German]Currently there seems to be massive trouble with the ‘Microsoft Update Catalog’. Reaching Microsoft Update Catalog seems to works only at random. Here are some information about the topic. Maybe blog readers can confirm the observations or know a cause and workarounds. If I want to search for an update, I enter ‘Microsoft Update Catalog’ into the browser’s address bar and select the catalog’s entry shown within the search results. But within the last weeks I’ve noticed many times, that the URL catalog.update.microsoft.com is causing connect issues. Sometimes Google Chrome reports a missing connection and can’t reach this site. And a few seconds later the Microsoft Update Catalogs page occurs. On some days Google Chrome reports, that this Microsoft page is insecure or not reachable. I’ve tested with several browsers, to exclude browser issues as a root case. And in Firefox I got this answer. Firefox told me, that he Microsoft Catalog site is unsecure. I double checked with Internet Explorer 11 under Windows 7 SP1. Then I got the following result. 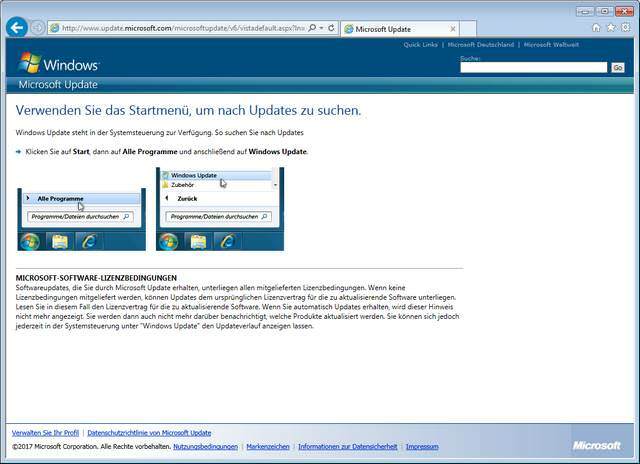 And suddenly the page flipped to the following content showing the page of Microsoft Update Catalogs. Because I still had opened the Google Chrome browser window in parallel, I noticed that the error message that was shown at the beginning of my test suddenly flipped to the page of the Microsoft Update Catalog, so the website worked again. A check in Firefox 57 showed that the page was displayed again after a refresh. A hint if others fall into the trap on the upcoming patchday. I am using the IE11 on different computers under Windows 7. 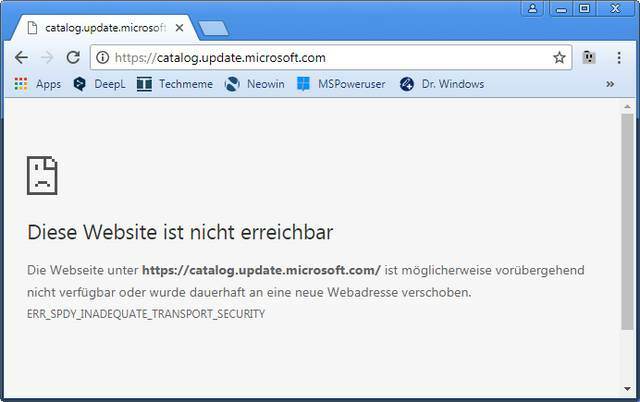 In the past, if I added the page of the “Microsoft Update-Catalog” with “https: // catalog[.Update[.]microsoft[. ]com/” into the list of “Trusted Sites “. But that doesn’t work reliably anymore! 50 times not, once yes – tested on different computers. The main page is always loaded correctly. But as soon as you enter a search term the “Search.aspx” script of the page runs into an error. As always with a meaningless ID:…. After 2 weeks I tried to investigate this issue. It does not help to delete certificate and browser cache or any other DNS server. The URL added to trusted sites should be https: // * . catalog . update . microsoft. com. But that doesn’t works. We need “https://www . catalog . update . 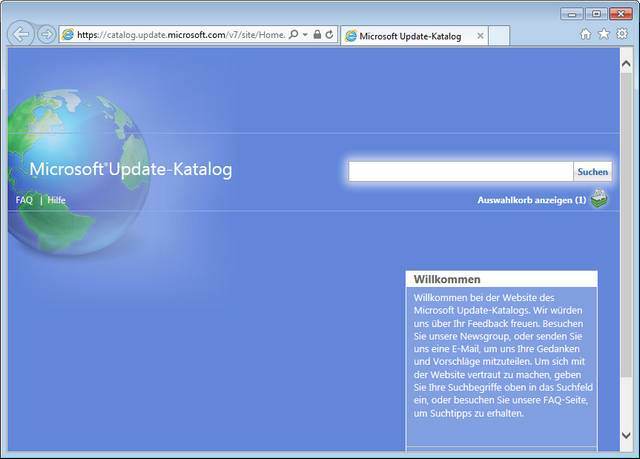 microsoft .com/ – without “www” the site “Microsoft Update-Catalog” won’t work reliable. I suspect the Microsoft servers behave differently, are not configured in the same way, not 100% IE11 script compatible. It depends on where you reach a server. You end up in the Microsoft server, certificate errors, script hell. This entry was posted in browser, Windows and tagged Catalog, issue, Microsoft, Update. Bookmark the permalink.